Before heading for Duskwood, you will need to hit up the auction house for a bronze tube, assuming you aren't an engineer. I would not pay more than 20 silver for one, although costs have been on the rise. Regard that bronze tube as a quest item. And on the note of quest items, you've got a few you're toting from Ashenvale, like Teronis' Journal. Bank them. They aren't going to help you right now, and you'll want the empty space. The only real downside to Duskwood is that the town is on one end of the zone, and a large set of the quests are on the other end of it, and you will need to go back and forth quite a bit. Our goal is generally to minimize the amount of back-and-forth running that you do. Run from Stormwind east into Redridge Mountains and get the flight point in Lakeshire. Get only the quest "What Comes Around..." from Guard Berton. Then double back and head down the southern road for Darkshire. Make sure you set your hearthstone to Darkshire's inn. Quests completed: a bunch of little stuff, and stuff outside of town. Our first goal is to grab quests, and they are all over the zone, even though most of them are in town. Pick up whatever quests you can find in town. The town hall, the inn, Madame Eva's house, the Carevin House, and the last house up the hill toward the griffin master all have quests you will care about in the near future. Then head down the road to the south that quickly bends to the west. Just stay on the road. When you get to the crossroads that leads to Stranglethorn Vale, there will be a night watch camp that should have a questgiver there. (Note: there is a creature called Stitches that you will sometimes need to watch out for on the road, and there's a possibility that this creature has killed your questgiver. If this is the case, wait it out. Do not try to find or fight Stitches.) Head further still down the road, and you will find a ghost town to the right side called Raven Hill. In the front area of the town, there should be a chap named Jitters pacing around the well. Have a chat with him, and then go back to the road and follow it to the river bank. We will actually do a couple quests along this trip out of town, and that means killing the creatures along the river bank. Keep a special eye out for Pygmy spiders for Eight-Legged Menaces. The other spiders are unimportant and you'll get the wolf quest real soon. You won't see many Pygmies in this area, but go out of your way to snag them when you do. Follow the river north. When you reach the corner of the zone, come in-land a bit and look for Sven and his partner at a small encampment. Sven's quest series is rather significant for the zone, but we care about the other questgiver at the moment, who has Wolves at Our Heels. After you get Abercrombie's quest, go back to the river bank and just hack and slash your way across the zone. Stay with the river all the way east to Redridge, or until you finish Wolves at Our Heels and Eight-Legged Menaces. The pygmies you need will mostly be found in the northeast corner, so don't get impatient. Most of these targets will be "green" to you, being level 18-20, but they are the place to start the zone, and the exp should still be decent. Make sure you save your Gooey Spider Legs, as you will need SIX of them in a quest shortly. Start out of town southward, but as the road bends west, there is a small path into a minor graveyard we will follow, and then break off immediately to go east from here. Our goal is a house north of the Tranquil Gardens Cemetery that can be seen on the map, the home of Blind Mary. We have two quests to talk to Blind Mary, so carefully approach her house to get some ghost hair and to find out about her mirror. That's our first stop. Our other target is the Tranquil Gardens Cemetery just to the south. The Night Watch finds us killing the random trash in the area, and you should continually check inside the chapel for the Insane Ghoul. He is not a super easy fight, so don't bum rush him, but he is on a long respawn timer, so you should start checking on him immediately. It's time to take a trip back to the west. Run down the road to the watcher camp and complete Eight-Legged Menaces. Then continue west to Raven Hill, give Jitters his grub, and follow the western edge of the cemetery north to talk to the hermit and to Sven. Refer back to scene 1 for where those two are if you've forgotten. I recommend not going around the eastern edge of the cemetery since the black widow hatchlings to the east can get pretty nasty. This completes the turn-in portion of this trip. Go west, and swim across the river into Westfall. As you pass by Sentinel Hill, grab the flight point. Who knows; you might need it some day. Then head to the southwest part of the zone, where the two roads meet at a deserted town filled with Defias bandits known as Moonbrook. Moonbrook is a very nasty place at level 15. Fortunately you aren't level 15. You want to enter the building that is in the northwest corner of the town and looks a bit like a ruined town hall. There should be no mobs inside the building, and a small chest near the rear of the back room, in front of the stage. Click on that chest to finish the first real leg of The Legend of Stalvan, and be attacked by a banshee that gives you a stinky curse. Kill off the banshee or run away, and then hearth back to Darkshire. Make sure you talk to the tavern keep for the Hermit's quest. Just like in scenes 1 and 3, you are going to head down the road, and stop at the watcher camp along the road to Stranglethorn. This time, take the road south, and turn left (east) at the zone wall. This will have you moving behind a couple buildings in the Yorgen Farmstead. Between the stable and the actual house is a loose mound of dirt. Be very careful; although they reduced the number of bandits here considerably, they are still each quite dangerous. Once you've finally gotten the journal out of the dirt, return to the road, and head for Raven Hill. We will actually enter the cemetery this time, so walk right past Jitters and through the gates. The entire southern half of the graveyard should be filled with mostly nothing but Skeletal Horrors and Fiends. By the time you get all the kills you need for The Night Watch, you should be finished Gather Rot Blossoms as well. Finish them both before moving on. While you're doing this, keep an eye out for the large green spiders and a big skeleton wearing golden armor. You want to avoid both of those if you can, and you want to RUN LIKE HECK if you get the golden skeleton. Mor'Ladim does not take kindly to strangers. Leave the cemetery to the west once you've finished, and head north up to Sven. After you've talked to him, go NORTH (yes, north across the river) into Elwynn Forest and run to Goldshire. The inn at Goldshire holds the key to the remainder of the Legend of Stalvan. The innkeeper will suggest you check a chest in a room on the second floor of the inn. Once you finish your business in Goldshire, head to Stormwind. The Stockades is hands-down the shortest instance in the game. And whether you have them all now or not, there are a bunch of quests you could be doing there that you should *hopefully* finish on one trip there. It's probably worth the hour that it takes to run through it with a bunch of newbies. This is the one of the few times in the guide I will specifically recommend going to an instance before level 60. Nonetheless, it's still optional and won't affect you otherwise. There are two other quests for the Stockades you are less likely to have. One requires running the Deadmines first and looting a letter from Van Cleef's body. The other is a follow-up to quests at Dun Modr in the Wetlands. If your groupmates have these quests, don't get confused or ask them to share it. Another optional activity: you may have picked up An Old History Book. If not by now, you will later on. The place to take that is the library in the keep of Stormwind, in an offshoot room to the left of the hallway the leads up to the boy king. OK, well, Stockades aside, there is one other thing you do actually need to do on this trip -- finish The Legend of Stalvan. In Stormwind, in the northwest end of the canals between the Mage District and the Garden is a man standing in front of a large pile of crates. Talk to him, and then check the boxes. One will be searchable. You'll be attacked by another banshee, and the quest trail won't specifically say where to go. But I will. Go back out into Elwynn and go to the east end of the zone. You might even consider flying to Lakeshire for that. (If you don't have that flight point, get it afterwards.) At the southeast corner of the Eastvale Lumber Co. is a house with a gentleman in front of it. He'll tell you to check a chest upstairs. (Getting used to this theme yet?) And after you search it...you guessed it...another banshee attacks you. Return to the guy in the front yard, and he'll send you to Darkshire. So go to Darkshire, possible stopping at Lakeshire along the way to finish the Stockade quest there. There used to be a different scene here, until I realized it was frustratingly hard. We're going to save that for later and just move back to Ashenvale. 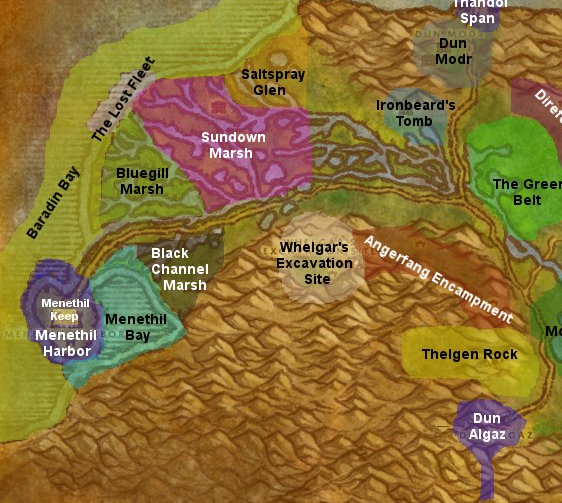 However, you want to be level 26 at the least in order to do the Ashenvale stuff, and there's a couple flight points and other minor things we'd like to get done as well just to have them, so we're going to hit up Menethil Harbor instead. Once upon a time, you would have the flight point already. Wrath of the Lich King redid the boats, meaning that the Auberdine boat no longer goes to Menethil Harbor, and there is no incentive to already have this flight point. To get to Wetlands, you are going to need to leave Ironforge on foot, travel east into Loch Modan, and then continue north through Dun Algaz into the Wetlands. Follow the road to its conclusion to reach Menethil. Grab wow quest=Daily Delivery on the way to drop off when you reach town. Travel east to the Whelgar Excavation Site. It's about a third of the way across the zone. Ignore the lower areas of the site with all the raptors and go up the ramp in the rear to get a couple new quests, particularly Ormer's Revenge. Leave the excavation site area and follow the wall west, looking for raptors to kill. If you see any Young Wetlands Crocolisks or Black Oozes, feel free to kill them, but you are looking for raptors. Once you have all your kills, return to the excavation site and go past it a bit. Orcs should be pacing about in front of the next opening in the wall, Angerfang Encampment. Clear through them a bit and get your 8 war banners, and then go back out to the road and finish up any crocolisk skins you don't have before returning to the excavation site. The follow-up to Ormer's Revenge will be noticeably more challenging, so don't rush it. Head into the actual digsite and clear your way slowly through the raptors there. As you do so, look around for urns, mounds of dirt, and anything else that sparkles. You will need to locate four of these objects for Uncovering the Past, and you will need to clear out the raptors who are all very aggressive. Go out to the road and head east until the road forks, and take the north path out toward Arathi Highlands. Gradually, stray off the road to the left until you find yourself at Ironbeard's Tomb. There are oozes all over -- black oozes outside, red oozes inside, and some monstrous oozes deep within. Any of them can drop Sida's Bag. It's completely random and some people have much better luck than others, so may as well stay topside. The reward for this is a 10-slot bag, so it's not a bad deal. You should be at least level 26 now. 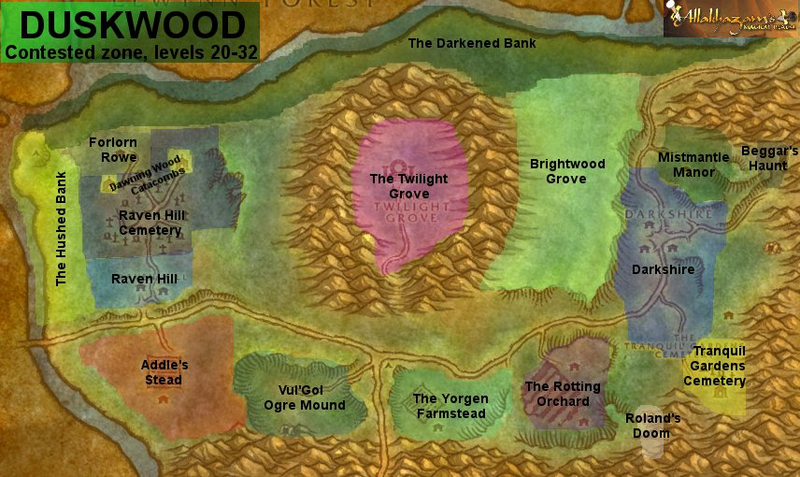 27 will definitely help in Ashenvale. Take the boat to Auberdine and fly back down to Astranaar. This page last modified 2008-12-05 15:23:32.